This is the first podcast script for the first podcast series I produced, on an A to Z of authors I really like. Looking for Author A was tough: Asimov, von Arnim, Austen, Alcott, Aaronovitch and Adams stare at me pleadingly from the bookshelf, but the English detective novelist Margery Allingham has the most shelf centimetres. 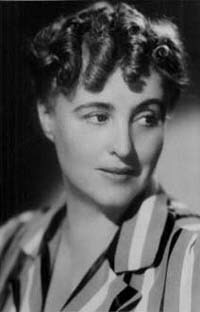 She published prolifically from the late 1920s until after her death in the 1960s, and was one of the British Golden Age detective novelists, women writing about the restoration of order in British society in the years between the two world wars, and into the 1950s and 1960s. They used a regular detective character to solve the mysteries: this, and the excellence of their writing, made them famous. The other Golden Age detective novelists were Dorothy L Sayers, Ngaio Marsh, Josephine Tey, and the one you’ve all heard of, Agatha Christie. 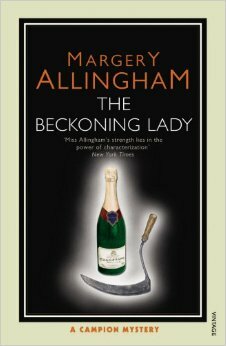 Allingham’s novels are the most complex and emotionally satisfying of the group. She writes more deeply than Tey, has a wider cast of characters than Sayers, is more interested in people than plot (unlike Christie), and is less hung up on police procedure than Marsh. 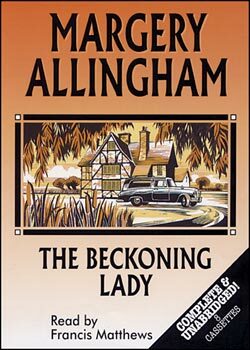 I like nearly all of her novels, but The Beckoning Lady (1955) is a continual favourite for rereading. It’s also a novel, rather than ‘just’ a detective novel, although it includes three deaths, two policemen and a private detective called Albert Campion. 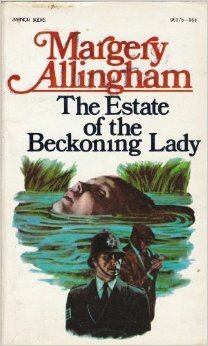 Mr Campion is a little more mysterious than the other Golden Age detectives, just as Allingham’s novels are a little hazier, more interested in social peculiarities, and a little more like fantasy than the novels of her peers. Campion lives in a world of artists, actors, designers and strange charming geniuses. He appeared first as a very improbable detective in the early 1930s, and is apparently an incognito minor member of the extended Royal Family, using an assumed name to avoid being associated with his relations. His wife, Lady Amanda Fitton as was, is an engineer and a designer of aeroplanes. Their son first appeared in the stories as a toddler examining a footprint in the mud with a large magnifying glass. I like this family very much, but details about them are elusive. a very dull cover, phoned in by someone who didn’t like the novel. Yes, fizz and scythes are involved, but there is so much more to be illustrated! Allingham is very good at inference. She makes you read her stories by employing the deduction of facts from very scanty clues. She is constantly allusive, not telling you things outright, so you are working out the significance of your observations all the time. This makes Allingham a very good creator of atmosphere, and impending doom. Her thrillers can freeze you to your seat as she pulls at your nerves one by one. 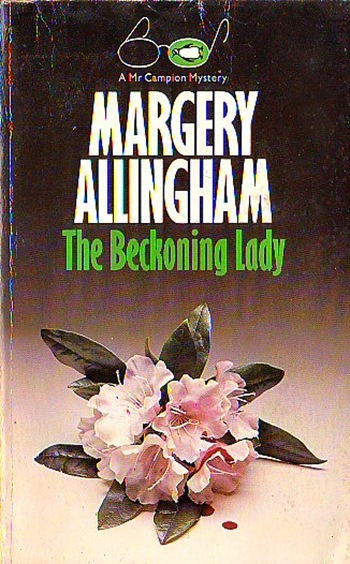 The Beckoning Lady is not as agonising as her post-war thrillers The China Governess, The Tiger in the Smoke, or Hide my Eyes, for instance. 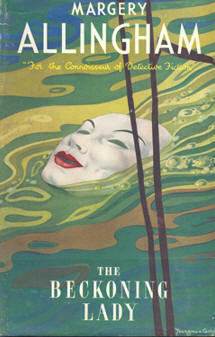 But The Beckoning Lady has a definite atmosphere of suspense. You know that you need to understand something very important about what has just been described, but, maddeningly, the clue has drifted past you, and you are groping in the fog. The Beckoning Lady is also a fantasy, a dream of meadows and hayfields in an English summer. Minnie and Tonker Cassands are preparing a large party, but are unaware that the death of their dear old friend, Uncle William, a week before, was not actually an accident. They also don’t know that there is another body nearby, lying in the water meadows. Minnie is a famous portrait artist, Tonker is an inventor, and their Bohemian friends are rollicking down from London for the party. Their way of life, even in their middle age, is still as eccentric as it was in their 1930s heyday. They live in the Suffolk village of Pontisbright (which might be pronounced ‘Ponts’bry’), where Amanda was born, and this too is eccentric beyond expectations. The enemy of eccentricity, and of the independent artistic spirit, is modern post-war nosiness, being too interested in other people’s business. In this novel, in this society, the enemies are an over-eager tax inspector, an appallingly efficient secretary, and a man of business who believes that money can make life run the way he wants it. But for Campion, Minnie and Tonker, being lazy is desirable; being business-like is tiresome and a little unattractive; being pushy is unforgiveably bad-mannered. This is a Campion novel where he and Amanda are, for once, not chasing around trying to find time to speak to each other, but work together. Amanda was only 16 when she announced to Campion that she would like to be considered as his best girl. Campion, being English, and thus reticence personified, could only reply by pressing her hand and calling her ‘old thing’. In one of Allingham’s finest prewar novels, The Fashion in Shrouds, they pretend to break their engagement to flush out the villain, but still there is no sign of marriage. This unnaturally restrained attachment continues into the Second World War until Campion is bopped on the head. He gets amnesia in the middle of a case, and is forced to relearn his feelings for Amanda by working out who she actually is. They get married the day after the case is solved, and that’s almost all we are told about them as a couple. In The Beckoning Lady, some twelve years later, they are relaxed, and on holiday in Amanda’s old home. They have conversations, they help with party preparations, Amanda happily fixes mechanical problems for the village. Allingham is finally showing us what we’ve had to infer all these years. This may not sound like much, but if you’ve been following a couple with interest through years of novels, this much information is quite a harvest. The child characters are endearing. Campion and Amanda’s son Rupert talks by dancing, and is learning how to invent jokes. He needs a sleep in the afternoon before performing his duties as a very junior barman at the party. He has to be chased over the house before he will consent to getting dressed, and there are breakages. Thirteen-year old Annabelle manages the table-polishing by pulling the fat toddler twins about on their bottoms in padded pants. Eighteen-year old Westy realises that his marvellous best suit, the one that his aunt Minnie painted him in, is now too tight: he’s still growing. An admiring girl at the party suggests that he takes the jacket off, and, thus divested and with more comfort around his broadening shoulders, Westy finds his confidence. His best friend George, whose voice is breaking and who is thus too shy to speak, suddenly finds his voice and a girl four years older than he is, when he drinks a glass of champagne by mistake. The children are not sweet or charming, but matter of fact, and intelligent. They refresh. The policeman on the scene, Chief Inspector Charlie Luke, is in love, with a medieval beauty called Prunella Scroop-Dory. Luke is a post-war creation. He’s working-class, ex-army, bursting with energy and London knowledge. He is puzzled by ‘Campion’s strange world of nods and hints and mysterious understandings among people because they were or were not related, or had been to school or had served in a ship or a regiment together’. He is not from Campion’s background, or Prune’s. Prune is his opposite, the last of a very old county family, and has been bred by an eccentric mother for the kind of polite society that died out two hundred years ago. She tried going to parties, but couldn’t change her nature, much like an Afghan hound wouldn’t change if you let it run with a pack of fox terriers. Campion dreads their disastrous love affair, but Campion doesn’t know very much about love. Campion has a servant, the truculent and obese Magersfontein Lugg, who is a reformed thief and a grumpy assistant. He debunks every situation with devastating realism, and is rude to everyone. He arrives in this novel by getting out of a golf-cart backwards, on account of his fatness: ‘he wore tennis shoes, a pair of black dress trousers that he was using up, a white linen coat as a badge of office, an open-neck shirt to show his independence, and a hard black hat to show the natives that he came from a civilised city.’ Lugg can talk to locals where Campion won’t be accepted. His former career in crime makes him an encyclopaedia on criminal exploits, some of them his own: all part of this counter-factual social history. The novel has a powerful atmosphere of country magic and mischief. The villagers eat peacock pie on Midsummer’s Eve. Old Harry can tell how long a ploughshare has been lying in the grass by sniffing the crushed herbs on the metal. Charlie Luke falls asleep in the fields from exhaustion and wakes up underneath a large and gentle rhubarb leaf: this has protected him from moon madness. The ladies are given formal Victorian bouquets made with flowers stolen from the village gardens. The children are like Titania’s fairies at the party, flitting about with bottles and plates. When the clowns arrive, ‘the garden-party quality of the gathering turned into something wilder. The setting sun shone brighter, the wind got up.’ Prunella sits at the party like the queen of the fairies in glorious happiness, with Luke standing beside her like Oberon. Allingham painted with words. Sometimes she overdoes the pastoral descriptions, of tree and leaf and flower deliberately, so Lugg can wheeze with sarcasm: ‘that’s a loverly drop of nachure’. But most of the time she convinces us. We see colour, we feel heat, we sense distance and scale, we see a picture. Constant preparations for the party make us feel involved, and we want to join these very interesting people by the river in the summer night with the fifteen magnums of champagne. Dropped remarks about fixing horse-races, and a millionaire made miserable by his accountants telling him what to do with his money, seem irritatingly irrelevant. When the clowns begin their crosstalk act, hanging from the posh people’s balcony, and reveal the secret plans to buy the village and turn it into a race-track, we and the journalists and the interested villagers are all watching the discomfited businessmen with fascination. It’s a good thing that we’re distracted because the third corpse is about to arrive at the party, drifting down the river. This is a dreamlike novel, and a deeply satisfying one. Reading it will make you want to have a party for all your friends at midsummer.